Grab a lift ticket on your way to the mountain and save! 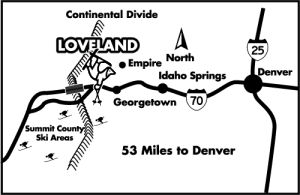 Swing by one of Loveland’s official offsite ticketing locations to snag a Loveland lift ticket below the ticket window rate. These tickets are valid any day of the 2018/19 season and are available starting December 15 through April 14, 2019 when regular season pricing ends. Offsite lift tickets provide direct-to-lift access at a great low price! We are still adding additional locations, so please check back for updates. Must Have Military ID. Adult tickets only. Military base price $64.